At schools and in higher education, videos and Touch Displays are used as an instrument for exchanging ideas and for more engagement with the students. Streaming providers such as Netflix, Amazon Prime and Co. are no longer the only channels which are used every day. It has also become a part of school education. An education video work report of 2017 shows that 99% of institutions work with teachers who routinely integrate videos into their classes. Students engage more while learning with videos, while potential employers expect them to leave education with the skills they need to participate in digital culture. 73% of universities offering distance learning videos for education. More than half of the universities use video for presentations and even interactive Touchscreens to interact with students at different locations. In addition to distance learning, 65% of universities record their lessons, to be used mutliple times and from various locations. Statistics show that 38% of colleges want at least 25% of their classroom in digital form and even more would wish for more 47% in interactive and digital material. 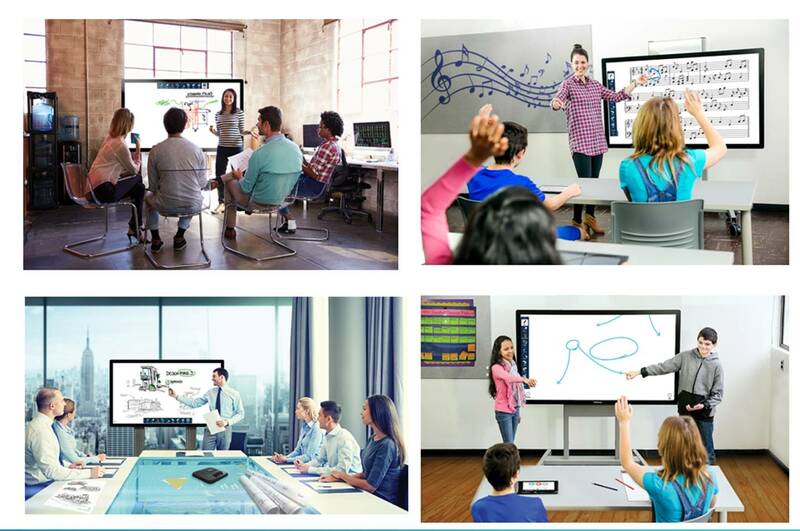 With videoconferencing systems and touchscreens like the INF7530eAG with 75″ and 4k, universities can connect students who can not attend classes for geographical and personal reasons. Overall, many teachers feel that using videos make students more satisfied with their education, and up to 85% of students believe it can improve students’ performance. Touchscreens make it easy to record videos, edit them on the run, pulish and distribute them and even interact on one single document. At the same time, 62% of universities use touchscreens for homework and 60% think that it will increase their skills and concentration. The reasons are as easy as posts are presented and created together in class and therefore result in better interaction with every single student. The creation of interactive content is increasingly becoming an important part of teaching and lecturing. Although it has become easier to create videos, surveyed universities report that less than 10% of students create videos as part of their classroom work and even fewer (8%) regularly create videos in class. However, the numbers go up. This year, 21% of respondents said they think the majority of students are actively using video. The teachers and proffessors also suggest that the use of video and touchscreens in education will continue to increase in the coming years. Instead of viewing videos and videoconferences seperately, it will simply be another way of communication and accessing content allover unis and schools. This entry was posted in JTouch, Touch display, touch screen and tagged INF7530eAG, Touch Display on 9. April 2018 by Nicola.